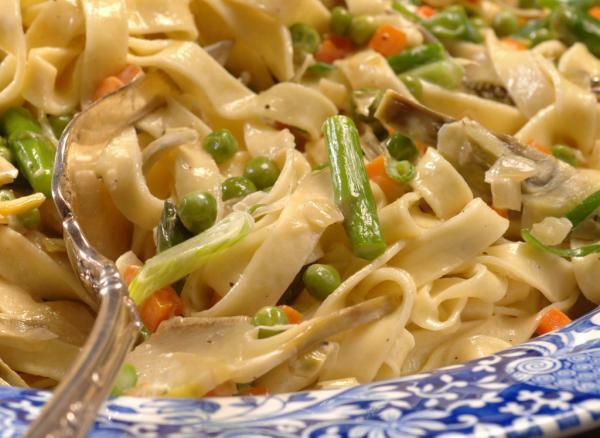 Pasta Primavera, though influenced by Italian cooking, is an American-Italian dish that was born in New York City during the 1970s, when Italian-style cooking was at the height of its popularity as an American culinary trend. Pasta Primavera is a fresh, light and bright dish with a little more texture and crunch. Pasta Primavera is almost always served as a dinner entrée. 1 Heat the olive oil in a pan and saute the bell peppers, mushrooms, onions, bacon, and eggplant. Season with salt and pepper. 2 Add crream and simmer for 1-2 minutes. 3 Add spinach and cook until wilted. 4 Toss in the pasta. 5 Sprinkle parmesan cheese and parsley over the pasta before serving.